Limone is a popular tourist resort on the shore of Lake Garda, in north-east Italy. 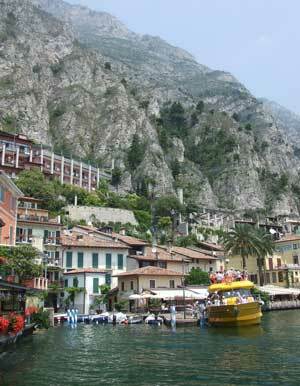 It lies at the mountainous northern end of Lake Garda, and rocky cliffs rise up behind the waterfront town centre. Limone is a picturesque place to stay, and a good base for exploring and enjoying the lake, although summer holiday-makers should be prepared for crowds in the little historic lanes. Limone is the Italian word for 'lemon' and this shore of Lake Garda was once renowned for growing lemons and other citrus fruits. Limone's name, however, is no more than a happy chance, since it is said to be much older than the lemon groves, and to derive from a Latin word meaning 'boundary'. The town is still close to a boundary: between Italian regions. Lake Garda is shared by three Italian regions; Limone is part of the province of Brescia, in the Lombardy region. It is known as Limone sul Garda, to distinguish it from another Limone (in Piemonte). Parts of the 2008 James Bond movie Quantum of Solace were filmed around Limone, although the shoot was dogged by bad luck and talk of a 'curse'. Scenes include a car chase along the lakeside road, the Via Gardesana. The heart of the old town is the little harbour, the Porto Vecchio ('Old Port'). From here, narrow lanes lined with tourist shops wind along the shore and up the slopes behind. There are pleasant and picturesque waterfront terraces, and plenty of places to eat and drink while admiring lake views. Following paths to the north of the harbour you leave the hustle and bustle behind, and pass scattered hotels, peaceful cafe terraces, abandoned lemon groves and little swimming beaches. In the other direction is the more modern part of Limone: a wide waterfront promenade, car park and many more hotel developments. This end of the town sprawls over the area where the mountains are set back further from the lake: here olive groves are interspersed with hotels and swimming pools. 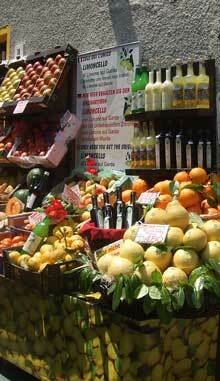 Limone's lemon-growing history is to be detailed in a museum which is still at the planning stages at the time of writing. In the meantime, visitors can tour an old lemon grove, the Limonaia del Castèl, which is open every day in summer and on Sunday afternoons in winter. Old lemon gardens, terraces with stone columns and walls, are a feature of the lake's former citrus-growing areas, and are very striking when viewed from passing boats. For the fruit to survive winter temperatures, the groves needed seasonal roofs and heating. With the unification of Italy and the construction of railways in the nineteenth century, oranges and lemons from the warmer south and Sicily were easily available and cheaper, and the Garda lemon groves were largely abandoned. Limone's other agricultural industry is olive-growing, and there is also a little exhibition devoted to the local olive groves and oil-making process in the town's olive-oil mill. Limone has several churches which are worth visiting. As you tour, you will notice various pictures and shrines to a bearded saint: this is Daniele Comboni, a missionary who was born here in Limone in 1831 and was canonised in 2003. The Chiesa di San Rocco is an appealing small church close to the old port. It was built during a bout of plague in the sixteenth century, and dedicated to the 'plague saint' Rocco (St. Roch, or Rock in English). It contains some lovely frescoes. The parish church is the Chiesa di San Benedetto, in a panoramic position above the lake. Although the site is older, the current building mostly dates to the seventeenth century. It's a fairly large and extravagant affair, presumably commissioned with the proceeds of lemon-growing. The style is baroque, and there are several altars and paintings worth a glance. Limone's oldest church, the Chiesa di San Pietro, is a short walk from the main part of town. This chapel dates back at least as far as the twelfth century, and it contains some twelfth to fourteenth-century frescoes. As well as pottering around the waterfront and lanes, and relaxing on cafe terraces, Limone also offers the chance for sunbathing or swimming. There are a few small pebbly beaches north of the town centre, including a private 'beach' establishment on terraces, with sunbeds. South of the centre is a much larger, more open stretch of long stony 'beach'. The regular boat services are a good way to explore Lake Garda, and tourists staying in Limone should definitely pay a visit to picturesque Malcesine, on the far shore. There are a couple of tourist information offices in Limone; one is on the main road by a car park and bus stop; the other is down on Lungolago Marconi, facing the waterfront. The Limone tourist industry is well-organised, with plenty of information, free maps, guided walks (more below) and a programme of special events such as free open-air concerts. I know some past visitors who rate a Limone concert of Viennese operetta highlights and Neapolitan songs among their best ever holiday memories. There are various short walks at low levels around Limone, and an information sheet from the tourist information office is a good place to start. There are also more serious walks in the mountains behind town. 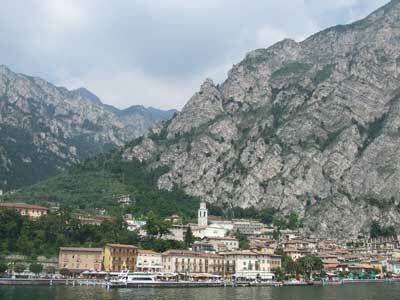 The Gruppo Alpino di Limone organise free guided walks from Limone between June and September. Typically their walks are on Sundays, Tuesdays and Thursdays, and range from 'difficult' standard requiring walking boots and a whole day's walking, to 'very easy', meandering through olive groves. Again, the latest information can be found in the Limone tourist information office. Since the organisers provide basic directions in their leaflet, keen walkers could combine these details with maps to do the walks independently. Limone is situated on the most dramatic section of Lake Garda, and the harbour area is like a postcard; it is certainly one of the most photogenic resorts on the lake. Potential visitors should note that resident population of Limone is small, and so when the hotels fill up with English and German-speaking tourists in summer, it does feel like a busy resort rather than a living, breathing Italian town. If you want a more 'normal' Italian feel, you could try the large town of Desenzano at the flatter end of the lake, or Riva at the northern end. 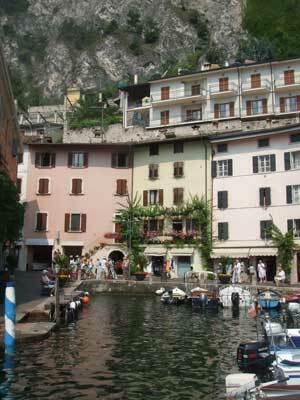 Even Malcesine, opposite Limone, has more little lanes among which tourists can spread themselves. However, Limone is very pretty, and convenient for travelling around the northern lake. It also has walking opportunities, although it doesn't have the advantage of a cable-car like Malcesine. For a holiday that feels like a holiday, Limone makes a very pleasant and scenic base. Limone is served by the regular Lake Garda ferries, and the other northern resorts are a reasonably short boat ride away. You can buy day tickets for either the whole lake or just this northern end. There are also private companies offering excursions and organising quick crossings to Malcesine, a journey which takes around 20 minutes. The town is on the main road which circuits the lake, the Via Gardesana. This goes through Limone, above the town centre, where it is briefly named the Via IV Novembre, before disappearing into tunnels. There is car parking on the main road, and more down by the modern port. Bus services connect the towns along this western shore of the lake, with some travelling on to Brescia, which has a budget airport served by Ryanair (they call it 'Verona Brescia'): Brescia Airport. Other airports which are near to Limone are Milan Bergamo to the west and Verona to the east. In Limone there are several bus stops along the main road; the most central is alongside the car park and tourist information office. Most of the hotels in Limone are spread to the south of the town centre, where there are wider, gentler slopes between the mountains and the lake. For a totally central option for a short stay (or for guests who don't mind the lack of a swimming pool), travellers could try the three-star Hotel Monte Baldo, a small hotel which faces directly onto the tiny harbour. I didn't visit the hotel but I enjoyed an excellent meal at its bar-restaurant below, where in addition to fine main courses, the bar also offered a refined version of a 'happy hour' during which you could help yourself to free snacks and savouries to accompany your glass of wine. The building has a terrace, and has recently been renovated with pleasant modern interiors. Even if you don't stay in the hotel, I'd recommend it for eating and drinking.